Purchase the album on Amazon. Little & Ashley's Official Website. The quirky California based songwriting duo got their start when they wrote and recorded "Fly Me Away" for an Amazon Kindle commercial contest entry, also starring Annie Little. The entry won and thus, the duo made a deal with Amazon to compose additional music for Amazon's Kindle commercial series. Annie Little and Marcus Ashley have each starred in numerous TV commercials and guest starred in numerous hit TV shows. So chances are you've already seen them and heard them, you just didn't know it! In addition, Ashley writes and records with the band American Weapon and Little is currently the face of Shade clothing. The EP kicks off with the cute and quirky "Stole My Heart." This song is the whole reason I checked out Little & Ashley in the first place. I love everything about it, the music flows so beautifully with the lyrics. 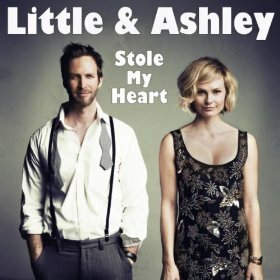 The chorus is catchy and sweet... "I love you, don't you see?/You Stole my heart 1-2-3/I love you, yes it' true/You stole my heart/And I'm gonna steal yours too..." Little & Ashley's vocals are superb. The piano driven "Telegrams To Mars" is another personal favorite. I'm honestly not sure what the song is about but I love it! Little's vocals are beautiful and the music is unforgettable, I've had the melody stuck in my head all day. There's an innocence to it that is so refreshing. It made me feel like a day dreaming little girl again. It's an all around feel good song. The kind that makes you smile... "So lovely on my pillow/Spinning webs with rain bows/Sending telegrams to Mars..."
which I liked, but the music reminded me too much of a circus or carnival. The EP ends with "Still Missing You." A song about a reconciliation between exes. I wasn't very fond of the lyrics, but the music was excellent! Overall; this is a cute and quirky EP. I enjoyed it very much. Although I love Little's vocals, my only complaint is that we didn't hear enough of Ashley and I wish we would have because his voice accents Little's wonderfully, and I think it adds a little something extra. I will definitely keep an eye on the duo, in hopes of future releases.